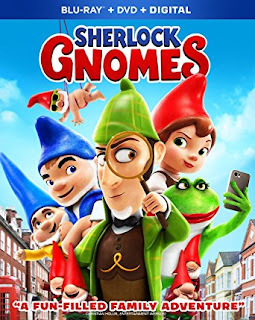 A hilarious and heartfelt adventure the whole family can enjoy, SHERLOCK GNOMES brings the fun home on Blu-ray Combo Pack and DVD June 12 from Paramount Home Media Distribution and Metro Goldwyn Mayer Pictures (MGM). Boasting an all-star cast of voices including Johnny Depp, Emily Blunt, James McAvoy and Mary J. Blige, SHERLOCK GNOMES is a rollicking adventure from the director of Kung Fu Panda! The Blu-ray Combo Pack is loaded with nearly 45 minutes of bonus content. Meet the all-star cast including Johnny Depp, James McAvoy and Emily Blunt and discover how this hilarious family adventure was brought to life. Plus, enjoy the new music video "Stronger Than I Ever Was," learn how to draw some of your favorite Gnomes, and much, much more! The DVD is presented in widescreen enhanced for 16:9 televisions with English 5.1 Dolby Audio, French 5.1 Dolby Audio, Spanish 5.1 Dolby Audio, Portuguese 5.1 Dolby Audio, and English Audio Description and English, French, Spanish, and Portuguese subtitles. The disc includes the feature film in standard definition. Produced by STEVE HAMILTON SHAW, p.g.a. DAVID FURNISH, p.g.a. CAROLYN SOPER, p.g.a. © 2018 PARAMOUNT PICTURES AND METRO-GOLDWYN-MAYER PICTURES INC. ALL RIGHTS RESERVED. Metro Goldwyn Mayer (MGM) is a leading entertainment company focused on the production and global distribution of film and television content across all platforms. The company owns one of the world’s deepest libraries of premium film and television content as well as the premium pay television network EPIX, which is available throughout the U.S. via cable, satellite, telco and digital distributors. In addition, MGM has investments in numerous other television channels and digital platforms. For more information, visit www.mgm.com.